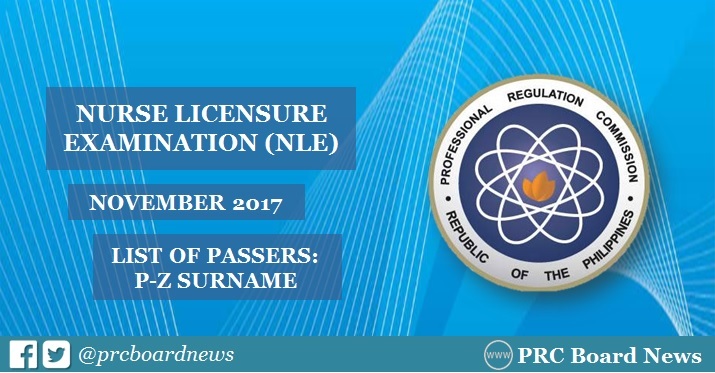 MANILA, Philippines - The Professional Regulation Commission (PRC) released results of November 2017 nurse licensure examination (NLE) or nursing board exam on Tuesday, December 12 or in 11 working days after the last day of exams. The list of successful examinees of the November 25-26, 2017 NLE is now available online. PRC and the Board of Nursing (BoN) administered the nursing board exam in various testing centers nationwide: Manila, all regional offices nationwide (Baguio, Cagayan De Oro, Cebu, Davao, Iloilo, Legazpi, Lucena, Pagadian, Tacloban, Tuguegarao) and Zamboanga. Based on PRC Resolution No. 2016-1019, the target release of NLE results is on Friday, December 15, 2017 or in fourteen (14) working days after the exam. On Tuesday, December 12, reliable source and review center owner, Dr. Carl Balita hinted that results may come out on Wednesday, December 13. Let me tell you my thoughts .... I am sure that every nurse seeing her name on this list sighed with relief. Because it is no longer necessary to cram at night the rules and regulations.